Feeding times are a litmus test of fish health, If a fish does not come and get food we need to find out why. African cichlids are aggressive feeders. When you walk in a room they normally shoot up to the front glass panel and beg for food. If a fish is not coming out for food and it is not a female with eggs, then there might be a problem. We suggest observing the fish and following up with water testing of the aquarium should you think there is a problem. An important fact to remember is the various different African cichlid species feed in very different ways. There are species which graze on algae, species which hunt smaller fish and ones which sift through the sand looking for invertebrates. Housing them all together can be tricky. One way not to have to deal with dietary problems is housing fish together that have similar feeding regimes. If this is not possible we suggest feeding a much higher proportion of vegetable matter to all fish. The pictures below show 3 different species that have all evolved facial adaptions to find food or graze on algae. A problem experienced in cichlid aquariums is the increase of internal flagellates (Malawi Bloat) in the digestive tract of your fish. These bugs live in the digestive tract in small numbers. When you add stressors, like territoriality and poor water conditions, you can get a large increase of these bugs occurring, which can cause it to become sick. Algae grazers have digestive systems which struggle with high amounts of animal protein. High amounts of animal protein can cause their systems to get blocked up. When this happens, the internal flagellates (bugs) increase in number and can make your fish sick. We try to feed a much higher amount of vegetable matter to all our fish, around 60%. The high vegetable matter ensures our fish are kept regular. This means the internal flagellates have a much smaller chance of a population explosion and reduces the chance of our favorite fish getting sick. 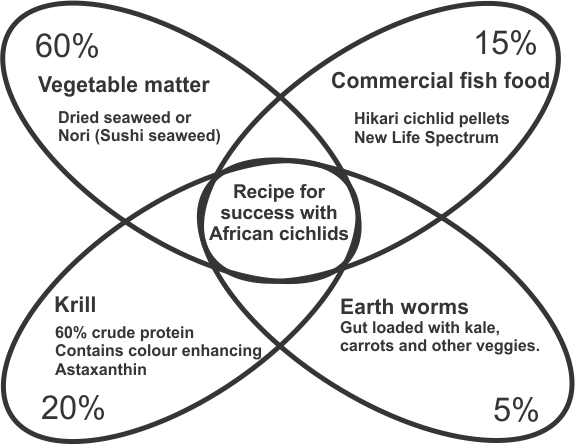 The diagram below shows the reason our fish are so healthy and vibrant. You are what you eat, this is a very real and important message. It relates to you and your fish. Our Winter feeding regime takes into account lower temperatures and shorter daylight hours. Feeding your fish Norill (dried seaweed and kril) is easy and fun. It is a good idea to not feed your fish for a few days before trying a new food. This is especially true for food likes norill which is like rabbit food compared to commercial food which has added ingredients to make it palatable. We always feed the norill in the morning and then a commercial food in the evening. Another benefit of feeding norill is that our fish resemble their wild counterparts. They have extremely vivid colouration and do not grow obese as you know your fish are doing far less exercise than in their natural habitat. If you feed them only a high protein (commercial fish food) they may get fat. We liken this to us living on a MacDonald's diet. They will grow quickly, develop average colour and over time, fatty deposits around internal organs may develop. The only cichlids in the wild which have a full or rounded belly consistently, are the algae grazers. This is due to the fact they need to feed all the time because the food has a lower nutritional content. When you feed them a diet made up of fish protein they wont stop when they are full!In fact, they will continue feeding as any opportunistic animal would. There will be a point where they will be unable to process the available protein. This is similar to your super yellow urine after consuming multivitamins. Over time, your fish get "super sized" and develop health issues. We strive to ensure our fish are lean and healthy. This ensures they also have the best possible colour and healthy strong offspring. These are the commercial foods that we feed our fish. One of the biggest problems associated with a heavily stocked African cichlid aquarium is ensuring every fish gets enough food. When we feed a commercial fish food we will always feed a large pellet type first. This effectively muzzles the larger fish. Allowing you to feed a smaller pellet type to the smaller fish. This trick is also very useful when adding new fish to your aquarium!